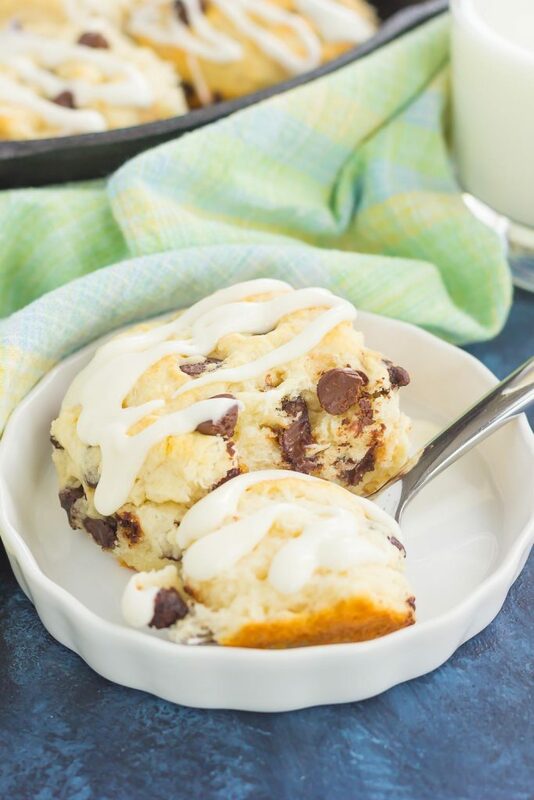 These Chocolate Chip Biscuits are light, fluffy, and filled with sweet chocolate chips. 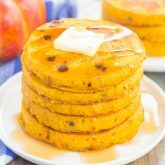 Easy to make and ready in less than 30 minutes, this simple dish is perfect for breakfast or dessert! I was going to make several different kinds of biscuits before these chocolate chip ones came about. First, I thought I would make a cheesy biscuit, filled with herbs. But then I remembered these biscuits from two falls ago, and decided against it. Then, I decided to make a buttermilk version, and went for it. And after a few tries, I got my buttermilk biscuit. But, I needed something else. Something with chocolate! So after a few more tries, these Chocolate Chip Biscuits were the winner. Although I found a little recipe inspiration from a favorite magazine, these biscuits were just what I was looking for. And homemade biscuits are where it’s at, friends. Especially these Chocolate Chip Biscuits. Did I mention that they’re topped with a sweet whipping cream glaze? It makes these biscuits extra special, and tastes just like homemade whipped cream, but in glaze form. And so easy, too! But, you knew that was coming, right? These Chocolate Chip Biscuits can be prepped, baked, and ready to be devoured in no time, with no mixer and just one bowl. One bite and you’ll be hooked on the decadent taste and soft and fluffy texture. 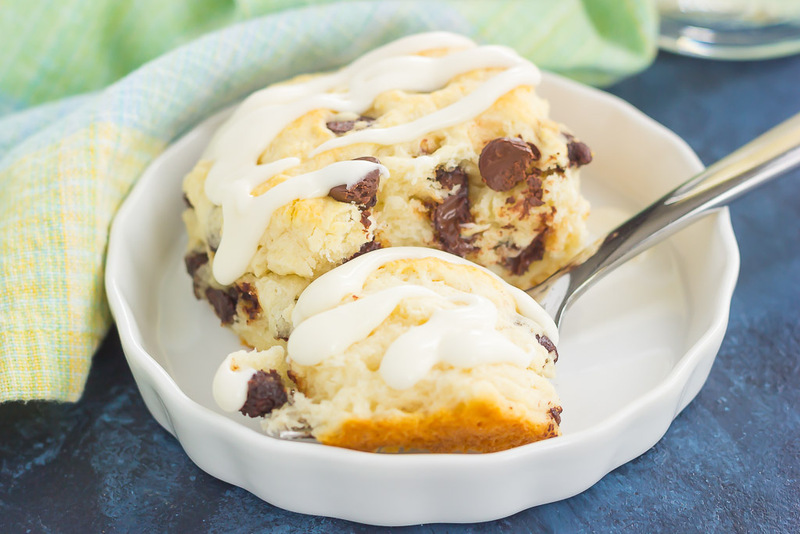 The chocolate chips provide the perfect touch of sweetness, bursting with flavor. 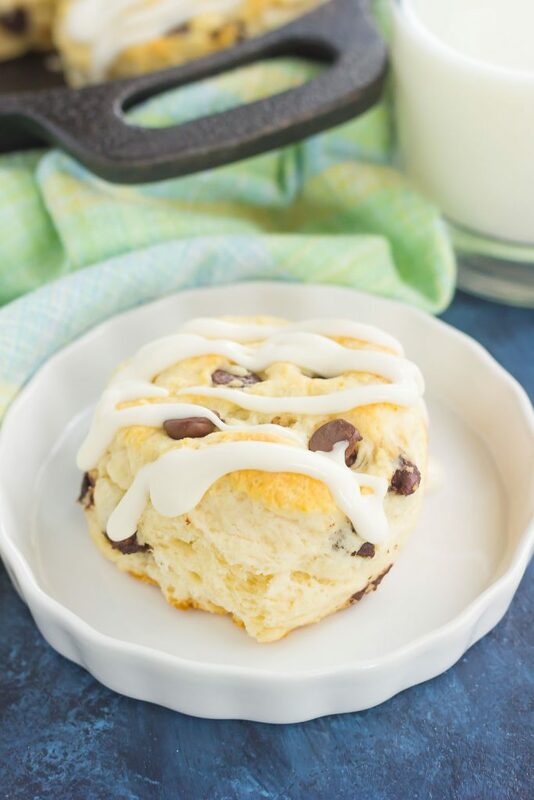 And that whipping cream glaze gives these biscuits the finishing touch…sweet, but not too sweet! Of course, you could always slather these Chocolate Chip Biscuits with butter, too. But however you eat these cuties, I guarantee you’ll love the texture, taste, ad ease of these biscuits! Looking for more bread and roll recipes? I’ve got you covered! In a large bowl, whisk flour, baking powder, white sugar, and salt. 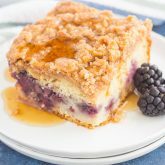 Using a grater, pastry blender, or two forks, cut in cold butter until mixture is crumbly (see note below). Slowly add in buttermilk, stirring to combine. On a lightly floured surface, knead dough 5-6 times and then roll about 3/4 inches thick. Dip a 2 inch round cutter into flour, and then cut dough. Roll remaining scraps and repeat. You should end up with about 9-10 biscuits. Place biscuits into a 10-inch cast iron skillet, touching slightly. Bake for 16-17 minutes, or until lightly golden. To make the glaze, whisk powdered sugar, whipping cream, vanilla extract, and salt until smooth. Drizzle over cooled biscuits. Thank you, Blair! 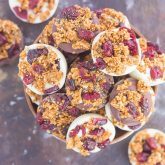 These are such a fun mashup for breakfast or dessert! One bowl yumminess right there! 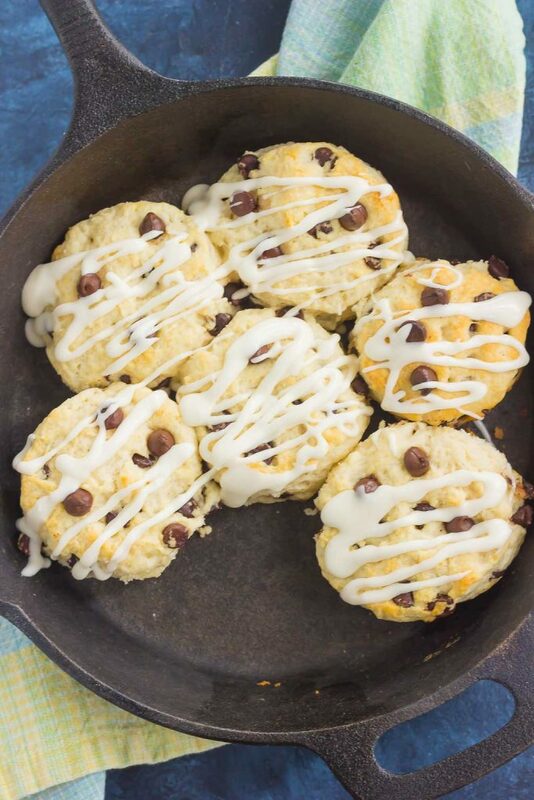 I've never had a chocolate chip biscuit, but I can imagine how lovely they are with that first coffee in the morning with butter or that glaze. I haven't had a biscuit I didn't like, but have only had savoury. Time to change that! Love that you served in a skillet too; one of my favourite things to serve in :) Pinned! Can't wait to give these a try! Have a wonderful week, Gayle! Thanks, Dawn! The chocolate in here is so good, especially with that glaze! My husband has a serious love affair with homemade biscuits... and anything with chocolate, so he is going to flip over these, Gayle!! 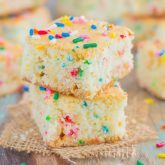 They look perfectly fluffy and absolutely delicious!! Can't wait to make these!! Pinned of course! Cheers! Homemade biscuits are the best! Thanks, Cheyanne! 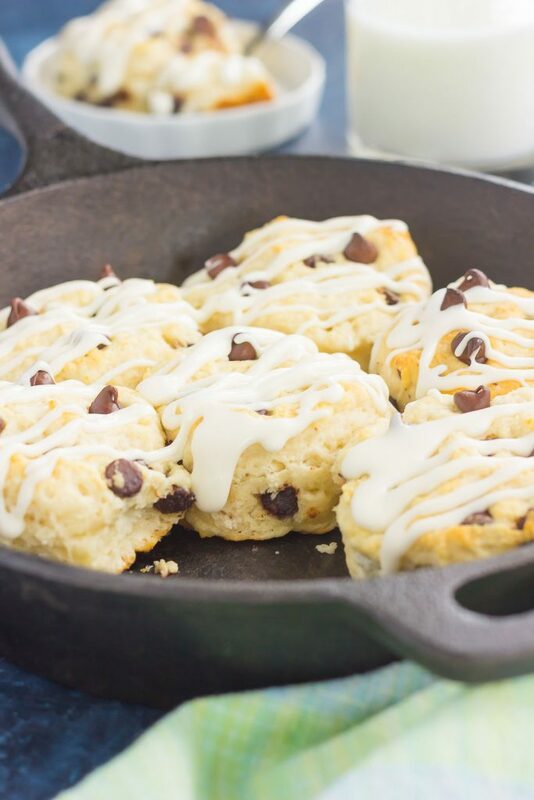 Homemade biscuits in a skillet - so homey and comforting! Love that you went with a sweet version! So delicious, Gayle! Pinned! Thanks for the sweet comment and pin, Annie! I'm kind of on a biscuit binge since I started making the topping for my cobbler several weeks ago. All I want to bake now is biscuits! I love this sweet version Gayle and I firmly believe that everything is better with chocolate! Thanks, Marcie! I totally agree, chocolate makes everything better! I love homemade biscuits! I can actually eat the whole pan, they look so good! Great idea to add chocolate chips. Can't wait to try them! I don't make biscuits nearly enough! These look so perfect! Love the addition of chocolate chips! yum, these would be hard to resist! Thank you for this really, really delicious recipe. I made this last Friday and it was gone in a few minutes. I am planning to give this away this holiday season. I'm so glad you liked this, Sheila! Thanks so much for letting me know how it turned out! Hello, can you bake them in a regular baking pan or it has to be baked in a cast iron pan? Hi Michelle! I've never tried baking these in a regular pan before, but I think it would turn out just fine. You may have to adjust the cooking time a little, though. Hope you love these biscuits and thanks for stopping by!